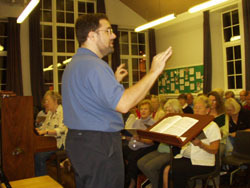 Rehearsals are normally held on Monday evenings in St James's Church Centre, Church Street, Wetherby from 7.30 to 9.30pm. Car parking at the church is limited, but there is ample parking in the Cluster of Nuts car park on Hallfield Lane, LS22 6JB. Morrisons car park is nearer, but there is a strict two-hour limit on parking which is rigorously enforced, even in the evenings, so beware. There are no firm rules, but you are asked to attend a reasonable number of rehearsals if you wish to sing in a concert, and you MUST be at the two rehearsals immediately prior to the concert. Conversely, those NOT singing in a concert are asked NOT come to the two last rehearsals, so that the choir at those rehearsals will be the same as the choir on concert day. Please tick the 'signing in sheets' which are passed around at each rehearsal, and do please tick the 'concert' column if you will be singing at the next concert. Unless you do this sufficiently far ahead of the concert, it may not be possible to name you as a singer in the next concert programme. Scores are normally supplied although members can use their own copies if they wish. We do not supply copies of Messiah, because most members have their own. The preferred edition is the New Novello edition, edited by Watkins Shaw, which is available from the usual outlets, or sometimes on ebay. When you mark up hired copies, please do so lightly with a soft pencil, and definitely do not use ink or a ball-point pen. It is vital that everyone tries to invite guests and sell tickets for our concerts. Don't leave it to other members! The time of the dress rehearsal on concert days is normally 1:50 for 2:00 pm (for a prompt start), so please be there in good time. The approximate finishing time will be announced at the Monday evening rehearsal before the concert. If you feel the need for refreshment, you'll need to bring your own; the facilities in the Church Centre are reserved for the needs of the soloists and orchestra. Please also remember that we need a team of people to set up the church for the concert. This involves bringing staging up from the crypt, setting it up, and arranging chairs for orchestra, choir and audience. We usually start at 11:45am on the morning of the concert and it takes around 45 minutes to do, depending on the amount of help available. After the concert, we have to restore the church to its normal layout, so it's all hands on deck to clear everything away. Please help if you can - the more the merrier. LADIES: Black skirt or well fitting trousers, black top or blouse (full or three-quarter length sleeves); no scarves. NOTE: This usually also applies to both men and women when singing at weddings, but not at funerals.
" I feel that aspects of general fine tuning have improved but the next area for attention is to persuade singers to look up at the conductor and audience . . . "
Please note that this section was compiled some years ago and, given the speed of technological change, certain aspects may now be out of date or just wrong - proceed with caution until we can revise the advice given below. Members strongly recommend MUSIC DYNAMICS for the well known "Choraline" rehearsal CDs and tapes in each SATB part, and also vocal scores, covering most choral works. Members of WCS can claim a 10% discount by quoting the password 'Wetherby' when they place their order. Ring MUSIC DYNAMICS on 01242 679379. 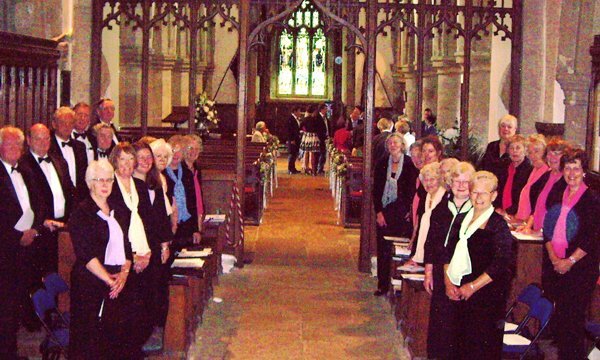 For a similar service, try NOTEBASH (on behalf of the Alnwick Choral Society) or PARTABILITY. I've also been told that Saffron Choral do cassettes and CDs at about £5. They sing your part and play it on the piano. Phone 01799 586 269. Several of our members recommend CYBERBASS. You can select a work and have your part played on the right-hand channel your computer's sound system, with an accompaniment (of sorts) on the other channel. Since this is a MIDI-based system, you can slow down or speed up the playback to suit your mood (or capability). Cyberbass has a wide selection of works available - and it's free! If you are comfortable with technology and want a good way of downloading the stuff we sing in MIDI format, then playing it back in any way you want, go straight to "More on MIDI" below. 'MIDI' is a simple way of producing music on a computer with very little use of memory or disk space. Because of this it can at best sound very simple and, at worst, like a child's 'kazoo' - high quality loo paper over a comb! But it does at least teach you the notes, even if tempo and dynamics are a bit lacking. And it is free! By far the best MIDI site is JOHN HOOPER which lists nearly all the sort of stuff we sing. Each piece is played in MIDI format with an "orchestral" background and can be downloaded in your part - S,A,T or B. Do read the "Introduction" page first. One snag you may find is that, having downloaded the MIDI stuff we are singing on to your computer, you cannot easily transfer it to an MP3 player. However, there is an incredibly simple solution, if your MP3 player can record. Just play the MIDI file on your laptop (but with the volume turned down - otherwise you will get a lot of distortion) with your MP3 player sitting on top in record mode. John Hooper's new web page gives another method to make both CDs and MP3 tracks, with a link to the software you'll need to do it better, and in a slightly less amateur fashion. If you want better control over tempo and which part sounds loudest (and pitch, too, if really needed!) try Chris Hills' program MidiPlay which you can get hold of free via John Hooper's site. You can download MIDIPLAY here.